Two gorgeous dogs! Seems like they are great companions for each other. Happy dogs, our dog gets real territorial when other dogs are around but she seems to bark more than bite. 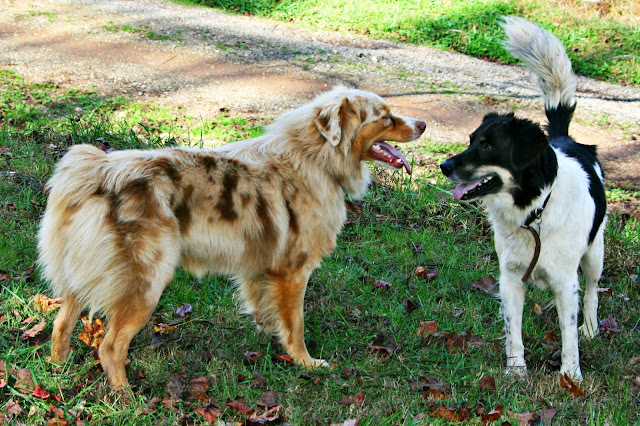 As pack animals, I do think dogs feel more comfortable with other dogs... great photos and commentary Lisa. 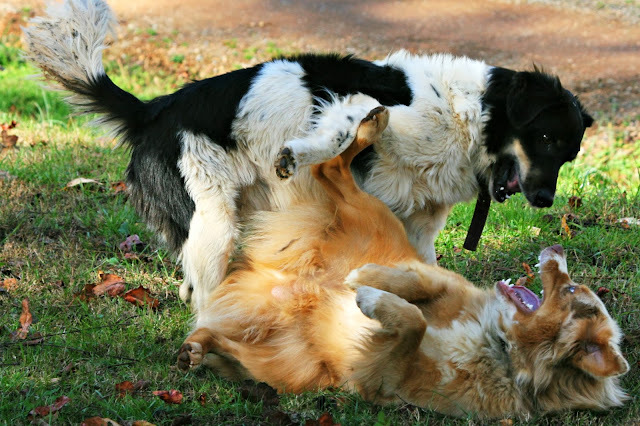 I see dogs play like that all the time. 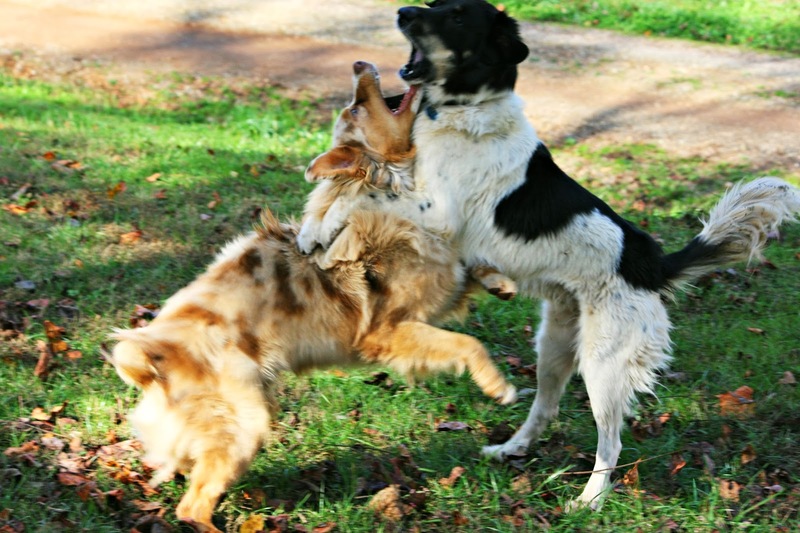 One pair at the rescue, a border collie mix and a little cattle dog mix, play just like that--always squabbling and snarling, chewing on each other, but it's not a serious fight. Dogs DO need friends and it's probably why we generally have two dogs at a time. 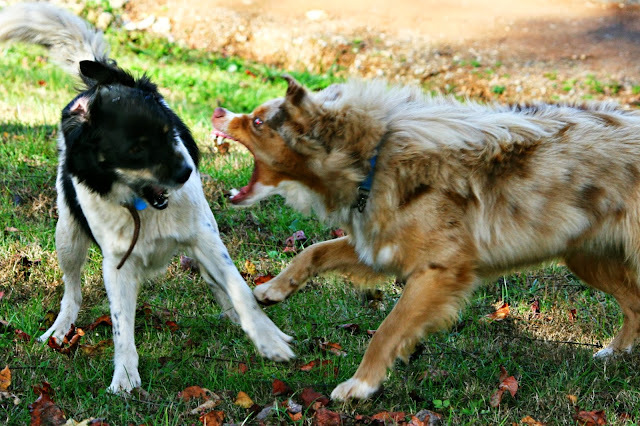 Ours play rough and cajole one another with mean growly faces every day... just all part of being a fun loving pup. xox LOVE THESE PHOTOS!! Our two toy Australian shepherds have great fun together. both are just gorgeous and smart pups! be safe, boys! These are adorable shots of their play time!! What a treat. I love dogs. Thank you for this - it's so joyful. Good looking dogs. They are pack animals and do need pack mates. I usually have around five or six dogs here. People haven't been dumping them off in the woods so much as they used to though, so right now I don't have that many. I could watch animals talk and play forever, these are super shots and Bailey does know how to make a scary face-gorgeous dogs! Yes, dogs do needs friends to play with. But that really is a scary face. Love the pictures. Dogs playing together like that bring me so much joy. Our girl Skye plays with my daughters dog Charlie often and they have a blast! That monster face would have scared me. Yikes. That's awesome they are good friends. They are both gorgeous pups! Our neighbor's dog would walk a mile to our house to eat our dogs food until it died of old age last month. I didn't even realize that dog was that old. Good to know their friends, as some of the 'toothy' shots would look otherwise! I am so glad that they found each other!!! Yes they do need friends. Wow, they look kind of scary! But in the last photo they are so happy! Beautiful! It sounds like they really enjoy their play dates. awwww i love these photos! how sweet...we've always had 2 dogs too but when we got ozzy, we made him an inside dog and he's so spoiled we just haven't gotten another. he does like to play with the neighbor dogs that wander into the yard! They seem to have fun! But tough play indeed! Those are really pretty dogs. Well...when they aren't "snarling" at each other! Chasing the school bus??? Wowza. They are so cute...Dogs who love dogs are awesome! !